constructive action for justice and peace. The intention for the November walk was for victims of sexual abuse. Bishop Lawrence Persico was among the participants in the Silent Peace Walk organized by Benedictines for Peace in downtown Erie, Thursday, Nov. 8. The intention this month was for victims of sexual abuse. Several dozen people gathered in front of St. Peter Cathedral at 7 p.m. They first recited a short prayer together, then fell into a line, single file, behind a sign announcing the silent walk. They took about 20 minutes to walk mindfully, slowly and intentionally around the block. Benedictines for Peace say the walk promotes inner peace, the foundation for constructive action for justice and peace. The groups traces the genesis of the effort to Piero Falci, who introduced Silent Peace Walks in Coral Springs, Fla., in 2006. Since then, the walks have spread across the world. 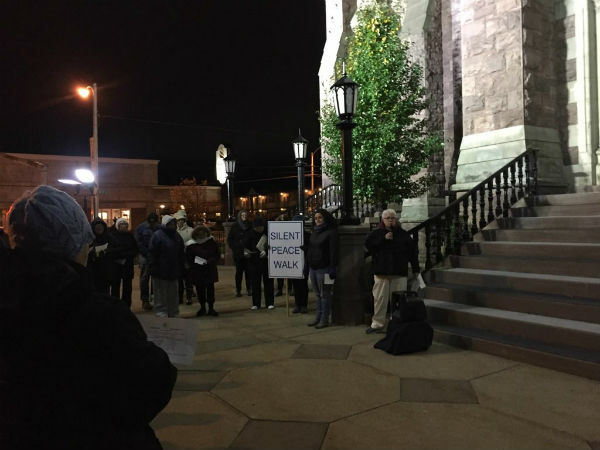 The Benedictines for Peace will host their next Silent Walk for Peace on Dec. 10 from 7 to 7:30 p.m. in Perry Square. They tout that gathering as particularly inspiring as the location will be lit up for the Christmas holiday.